Did you know that over 40% of OTR drivers have pets that ride with them? There are quite a few benefits to having a dog or a cat with you on long trips, but the most important benefit is that you're more likely to stay alert because you have another living being that you're responsible for. Drivers have said that they also feel more secure with a pet in the cab because they'll act as an alarm system for the driver. Having a truck pet is also a way to feel connected and not so lonely on long drives, which helps relieve stress. OTR companions are great for so many reasons! Global Transport Inc. wholeheartedly supports having truck pets! 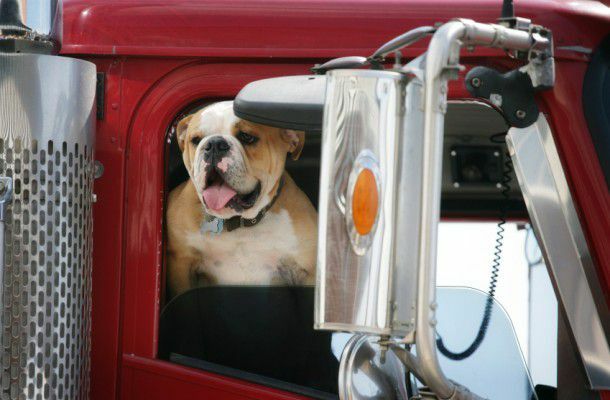 Many trucking companies don’t allow pets, so make sure the company you drive for does. Don’t assume you can break the rules once you’re hired – your contraband dog WILL be discovered at some point. Only experienced drivers (those with at least six months’ experience under their belt) should attempt to drive with a pet. There’s a lot to think about and attend to on the road, and fresh out of trucking school, you’re still learning how to do your job. Dogs around 25 pounds or less seem to do best as road buddies. Larger dogs take up too much room in the cab, which results in very cramped, uncomfortable quarters for both driver and dog. If your pet rides in the passenger seat, use a harness or other device that will secure her in the seat in case you have to brake suddenly. Always leash your dog before letting him out of the truck. Learn how long your pet can comfortably “hold it” and plan rest stops accordingly. Bring along plenty of clean, fresh water, and make sure your dog stays well-hydrated on the road. Since your dog will spend much of her time in the cab of your truck, it’s crucially important that she gets plenty of walks and at least one full hour of exercise each day. The good news is that by committing to exercise your dog each day, you’ll also benefit! To keep your pet mentally stimulated, bring along a selection of dog toys, puzzle toys, and treat-release toys, and offer them in rotation to your pet while you’re on the road. Truck cabs are small, confined spaces, so keeping shedding under control is very important. Short-haired dogs and those that don’t shed much are ideal, but daily brushing and frequent baths can be very beneficial in keeping shedding to a minimum. Also use bedding for your dog that can be washed at least weekly, and carry extra filters for your heating/air conditioning unit and change them regularly. It’s not a good idea to allow your dog to jump into or out of the cab unassisted, as it can be quite hard on his hips, knees, and joints. Either lift him up and down, or invest in a device like the Pet Loader. Travel with a crate or carrier for your dog, and make sure she’s comfortable going into it when necessary. There will be situations in which she’ll need to be crated for short periods, for example, if you deliver to a facility that doesn’t allow pets inside the gate.